New detections of radio waves from a repeating fast radio burst have revealed an astonishingly potent magnetic field in the source’s environment, indicating that it is situated near a massive black hole or within a nebula of unprecedented power. The findings by an international team of astronomers, including Victoria Kaspi and Shriharsh Tendulkar of McGill University, appear in the January 11 edition of Nature and are highlighted on the cover of the journal. 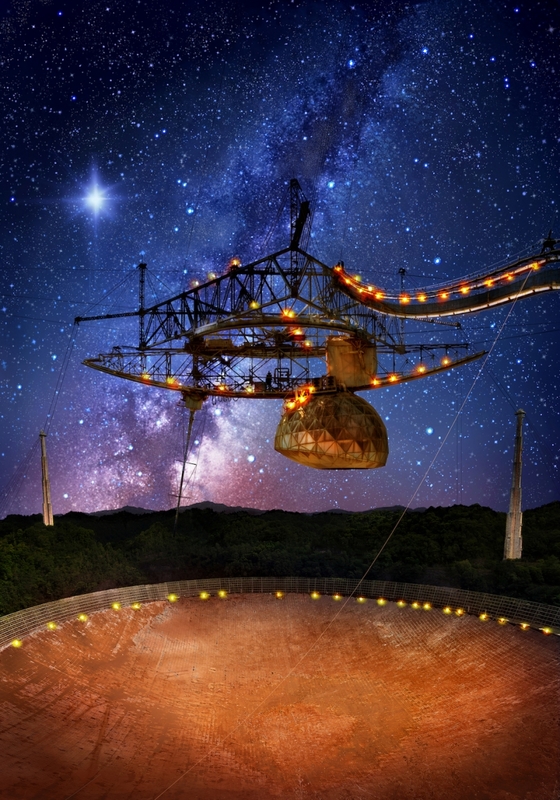 A year ago, the astronomers pinpointed the location of the enigmatic fast radio burst (FRB) source named FRB 121102 and reported that it lies in a star-forming region of a dwarf galaxy more than 3 billion light years from Earth. The vast distance to the source implies that it releases an enormous amount of energy in each burst -- roughly as much energy in a single millisecond as the Sun releases in an entire day. Now, using data from the Arecibo Observatory (Puerto Rico) and the Green Bank Telescope (West Virginia), the researchers have shown that the radio bursts from FRB121102 are highly polarized. The behavior of this polarized emission enables scientists to probe the source’s environment in a new way. When polarized radio waves pass through a region with a magnetic field, the polarization gets ``twisted’’ by an effect known as Faraday rotation: the stronger the magnetic field, the greater the twisting. The amount of twisting observed in FRB 121102’s radio bursts is among the largest ever measured in a radio source, leading the researchers to conclude that the bursts are passing through an extraordinarily strong magnetic field in a dense plasma. "I could not believe my eyes when my colleagues emailed the results around,” says Kaspi, who is a professor of physics at McGill and director of the McGill Space Institute. “This sort of enormous Faraday rotation is extremely rare. Once we digested it, we realized it was a huge clue about where this bizarre source resides." One possible explanation for the hugely magnetized environment is that FRB 121102 is located close to a massive black hole in its host galaxy. Such highly magnetized plasmas have so far been seen only near the center of the Milky Way, which has its own massive black hole. But the authors also speculate that the twisting of the radio bursts could be explained if FRB 121102 is located in a powerful nebula (an interstellar cloud of gas and dust) or amid the remains of a dead star. FRBs are a recently discovered class of transient astrophysical events, originating from deep in extragalactic space. Their physical nature remains a mystery. FRB 121102 is the only known repeating FRB, and this has also raised the question of whether it has a different origin compared to the apparently non-repeating FRBs. “FRB 121102 was already unique because of its repetition; now the huge Faraday rotation we have observed singles it out yet again. We’re curious as to whether these two unique aspects are linked,” says Daniele Michilli, PhD candidate at the University of Amsterdam and ASTRON (Netherlands Institute for Radio Astronomy). With a number of wide-field radio telescopes now coming online, more such sources are expected to be discovered in the coming year, and astronomers are poised to answer more fundamental questions about FRBs. "The CHIME telescope in Penticton, British Columbia, should be an excellent instrument for detecting fast radio bursts and studying their polarization properties,” says Shriharsh Tendulkar, postdoctoral researcher at the McGill Space Institute. “When it comes online in 2018, it should be capable of detecting between a few and a few dozen FRBs every day." Support for the McGill researchers was provided by the Lorne Trottier Chair in Astrophysics & Cosmology, the Canada Research Chairs program, the Natural Sciences and Research Council of Canada, the Canadian Institute for Advanced Research, and the FRQNT Centre de Recherche en Astrophysique du Québec.